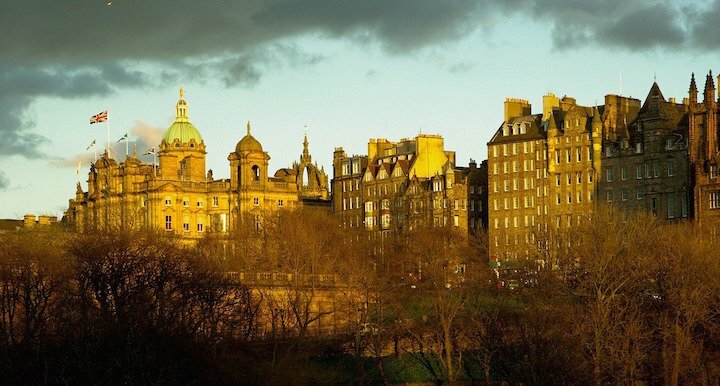 You’re paying top dollar for digs in Edinburgh when the festival is on so don’t waste your time hanging out in the pub (unless, like many, it doubles as a Fringe venue). 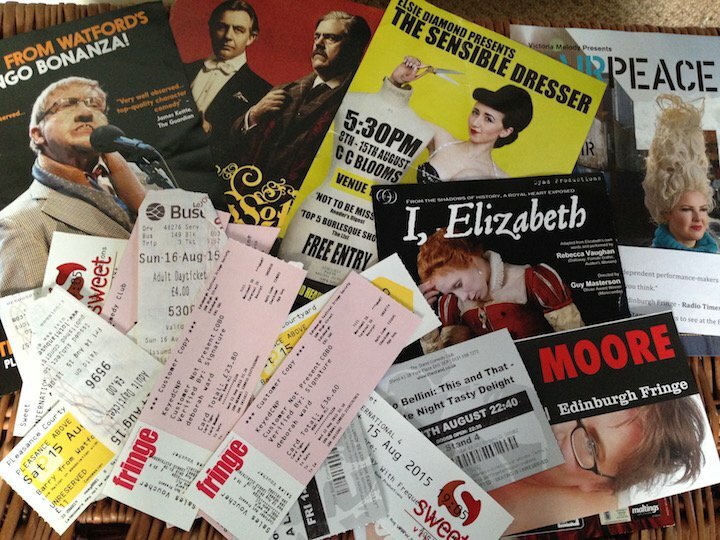 You get best value by cramming in several shows a day and with a bit of planning that needn’t be a slog. OK I’m pulling on my tartan anorak now to tell you what I do. 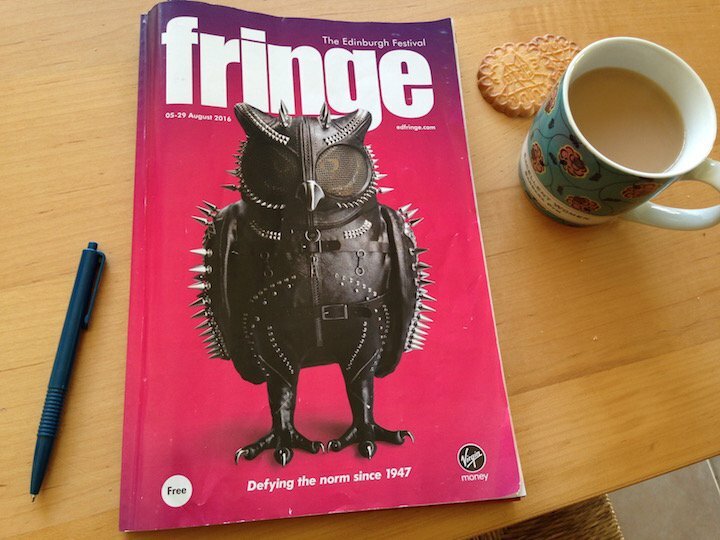 1) Get circling: Get the Fringe guide now (from edfringe.com or large branches of Waterstones) and – this is the fun part – get biro marking. I do this in short bursts over several weeks, down the beach, the pub, on trains, over lunch… Mark some must–sees and some maybes. 2) Make a shortlist diary: In a Word doc or something more whizzy, enter your dates in Edinburgh divided into one hour time slots. Stick your must-sees plus as many of the maybes as you’re still keen on at second glance into the relevant time slots (many shows will be repeated every day). 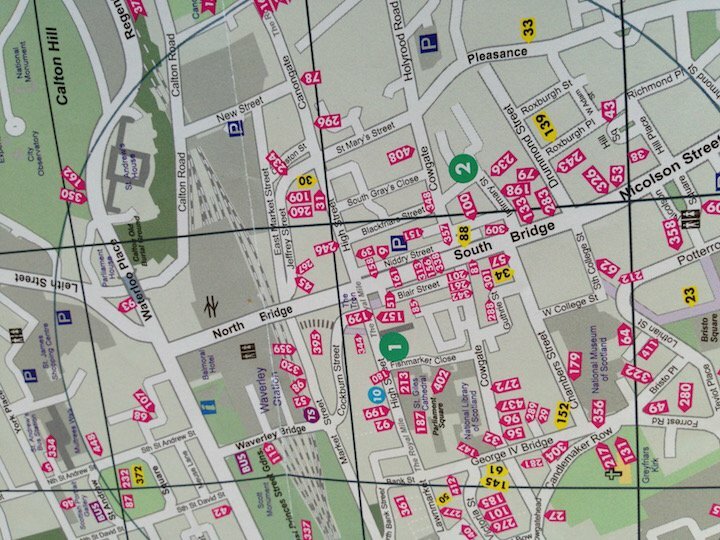 Include the show name, brochure page number and venue name, number and grid reference (this relates to the map in the back of the Fringe brochure). I also like to include a few words to remind me what the show is about and mark it based on how much of a must-see it is for me. 3) Cluster gigs: On the day, or the night before, make a plan. Shows usually last an hour, so, using your diary, on a daily basis you can comfortably pick say a 12.00, a 14.00 a 16.00 and a 18.30 then one or two in the evening. 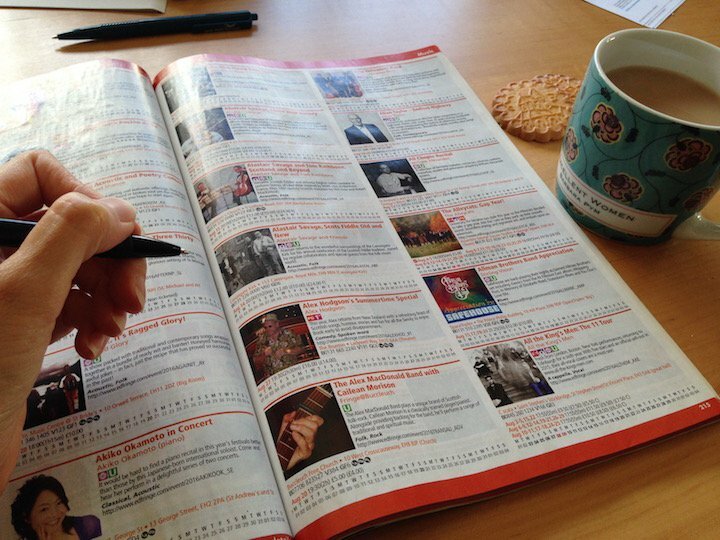 Start with your must-sees and anything you’ve pre-booked, then, using the grid references and the Fringe venues map see which others on your shortlist for the day are relatively close by and choose these, checking you’ve allowed enough time to get between venues. Should something screw up (like the year I joined a queue for a free version of the hugely popular Austenatious improv show only to find it had filled up 45 mins earlier) you should be able to quickly pull an alternative off your list. 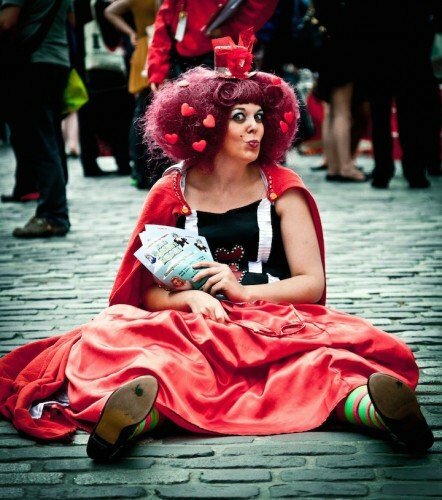 Pleasance Courtyard and Gilded Balloon are the big, popular venues where tickets sell out early (even for unknowns as lazier fest-goers just hang out there and take pot luck). Shows here are best booked a day ahead, or before leaving home if it’s someone well known. If you have children with you or don’t like unpredictability, book more shows ahead. 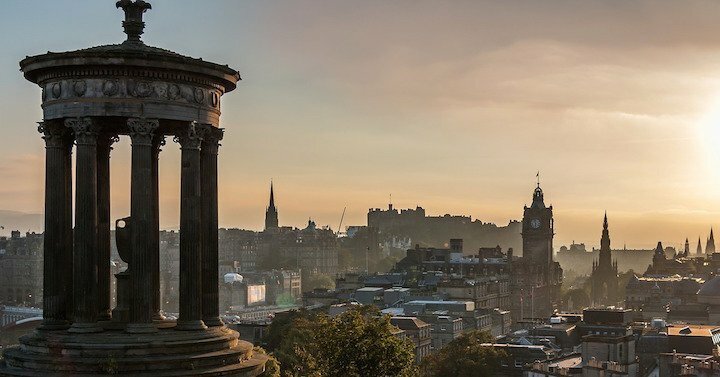 You can use your credit card to collect your pre-booked tickets from handy machines at Edinburgh airport when you arrive, which saves queuing at various box offices around the city. Gigs are cheaper Mon-Thurs so I try to see the pricier gigs on weekdays (you’ve also got more chance of getting a ticket). 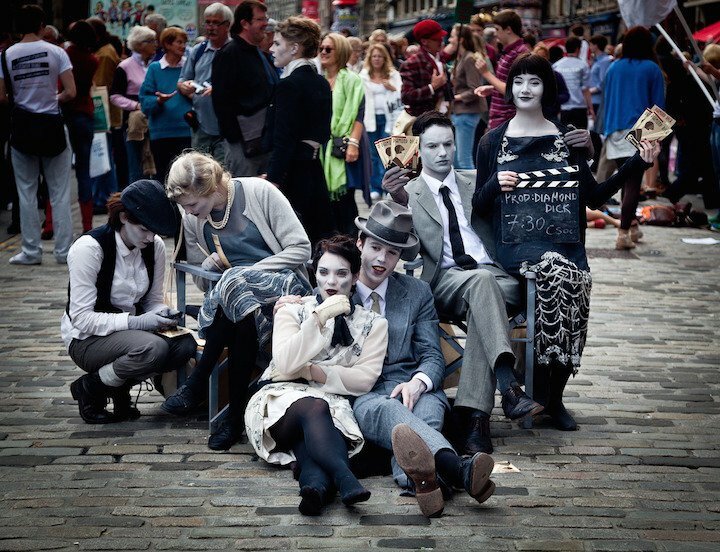 Fringe shows are nearly always hour slots. See your favourite comedian outside of the festival and you’ll often get more stand-up for your money. Check online if they’re touring near you later in the year before you commit – it could give you better value and mean you don’t waste valuable Fringe time on something you can see easily on your doorstep. 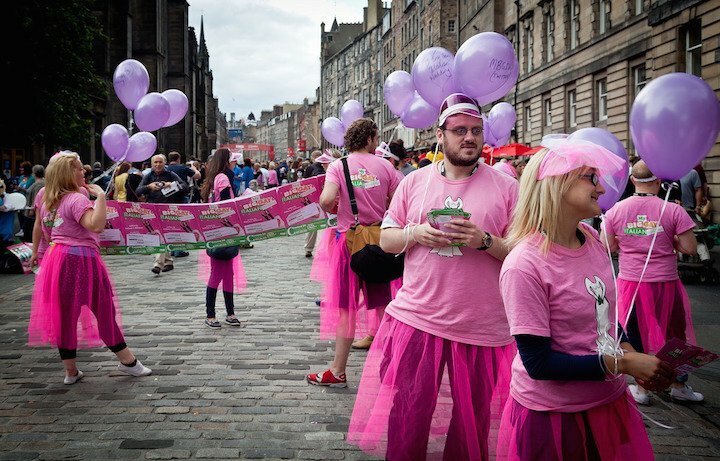 The Free Fringe is now so huge, it’s possible to spend your whole festival break without buying a single ticket. While it’s undoubtedly a place for try-outs, stand-ups trying to build a fan base and shows from amateurs who have a one-off story to tell, there are plenty of gems. Two of my favourite shows last year – a new stand-up and a storyteller/soul singer/burlesque act were free. Even established names do free gigs alongside paid ones; they might be trying out new material, dabbling in an area in which they’re lesser known, or simply being altruistic. For instance Phill Jupitus has for several years done a free comic poetry show. Oh and remember the ‘Free’ Fringe isn’t supposed to be actually free; it’s basically indoor busking and only the hardest-hearted would exit past a performer holding a bucket without showing some cash appreciation. These occasionally move after the brochure has been printed, which is frustrating, so best check on the web on the day. Keep your ear to the ground for what’s going down well. You can glean valuable word-of-mouth recommendations from other festival-goers over breakfast or in the queue for a gig. Every year there’s a buzz around a few acts, some more surprising than others. Had I not been recommended it I never would have bothered with What No Fish, a show with one man, some Tupperware boxes of Jewish snacks and an overhead projector. The bittersweet tale he wove showing the cartoons of family life his uncle had sketched on his weekly wage packets for decades had me in tears and remains one of my all time Fringe favourites. If I’ve a big ticket gig in mind I might be swayed by its star rating in a newspaper but 99% of the time I know the kind of thing I like and I trust my own judgement. Besides, hundreds of acts never even get reviewed. I find the best way to build an itinerary is to get tickets for a few safe bets and sprinkle the rest of my days with more wild cards. My husband and I see a lot of comedy year-round so a few years back he made it a rule that even though the festival is particularly known for stand-up we have to see a wider variety of acts. Now we throw in plenty of theatre, music, spoken word and more and it’s works very well. If you’re really into pot luck, use the GPS-linked festival app to browse what’s on near your location. ‘Murder Mile’ as it’s nicknamed during the festival is the main drag where hundreds of acts busk and thrust flyers at you. Wading through could add 20 mins to your walk to your next gig. I’m notorious for planning with my stomach but you don’t want your tummy rumbling through some poignant one-person show. If you’ve got a tight flit between shows in the middle of the day get a sandwich before the first to eat in the queue for the next. You won’t be able to see everything you’ve shortlisted, so check which shows you missed are touring and you can catch later in the year (Chortle.co.uk is a good source for comedy). 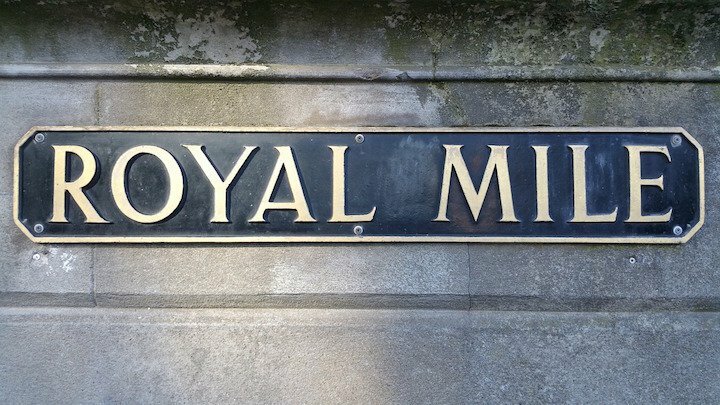 Look out too for local post-fringe festivals, for instance in Brighton in October you can catch a clutch of ex-Edinburgh acts at the city’s comedy festival.